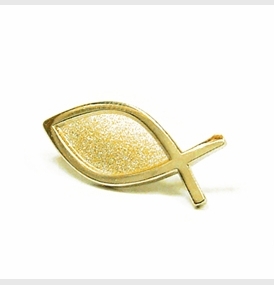 High quality Christian Jewelry, in the form of a Gold Christian Fish Lapel Pin with a push on butterfly clasp. The finish is matte bordered with shiny trim. very tasteful and pretty. got lots of compliments and it's a great way to share Him. I searched several websites to find a fish pin for our church, as we have a garden in that shape in front of our church. Support Store has the most reasonable price point, the desired gold metal finish, and the needed shape. The pin met or exceeded my expectations. I was surprised that SS delivered the order so quickly, just note I was in no hurry for the delivery.